New this week: Design Your Own Swag t-shirt contest! We want to help you dress for success! 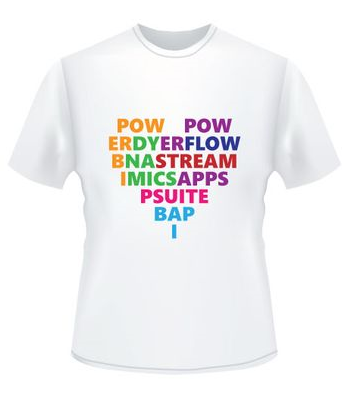 Some of our product t-shirts in the past have reached legendary status — everyone loves the "I've Got the Power BI" shirt! — and now we want to have your snazzy or crazy t-shirt ideas reach new heights at the 2017 Data Insights Summit, held June 12 – 13 in Seattle, WA. That's why we're holding a Design Your Own Swag t-shirt competition this week in the PowerApps Community. To enter, post an image of your shirt design as an entry in the contest by March 28, 2017, and then share it on Twitter with the hashtag #DataInsightsTshirt. Your image can be a detailed drawing, or even just a quick Paint doodle. Our graphic designers will polish your design up before we start printing, so it doesn't have to be fancy. The designs with the most kudos and Twitter likes will have higher consideration by the judging committee, who has final say on the winners. Note that designs must pass legal muster, so no copyrighted material or profanity, please. And don't forget to kudo your favorite shirt designs! They'll be given out as contest rewards and promotional items in the future, so let us know which designs you want to see and wear. Look at the entries now, submit your own design, and vote for your favorites!